Like his fellow West Australian Peter Sartori, Richard ‘Rocky’ Dennis was a boom recruit for the Blues whose career was derailed by a serious injury before it really got going. A versatile forward from East Perth, Dennis arrived at Princes Park in 1987 with good mate Steve Da Rui amid big expectations, and played in a Premiership team in his first year. But mid-way through his second season, one of his knees gave way, and from then on he was never quite the same player. Dennis stepped into the spotlight in Perth when he starred for the Royals as a teenager during 1985-’86. At 185 cm, his strong marking allowed him to play as a key forward, although his agility at ground level made him more suited to a flankers’ role. Carlton believed that he could develop into a real attacking weapon alongside Stephen Kernahan and Sartori, and so presented him with the number 3 guernsey recently made famous by the Blues’ 1981 and ’82 Premiership captain Mike Fitzpatrick. Dennis made a dream start to his new career, celebrating a win over Collingwood on debut at Waverley Park, and quickly establishing a regular place in a powerful Carlton line-up. Quick for his size and a good distributor of the ball on his preferred right foot, his form was so consistent by July that he was selected in the WA State of Origin team that met Victoria at Subiaco, and was narrowly beaten in a superb contest. Dennis quickly showed that he was a strong, fearless overhead mark that could fly with the best of them. By finals time in the AFL, Carlton had claimed the minor premiership by 4 points over Hawthorn, and by coincidence, met the Hawks twice more on the way to claiming our 15th flag on Grand Final day. Dennis was consistent and reliable in both matches, yet he surely must have thought he was dreaming when he and his team-mates paraded the Premiership cup around the pulsating MCG on that hot and sunny afternoon. Sadly, that optimism lasted only another few months. In March 1988, Rocky represented WA twice more during the AFL Bicentenary Carnival in Adelaide, and his stature in the game moved up another notch. But in mid-July, when Carlton met Collingwood in the match of the day at the MCG, the football gods turned their backs, and his world caved in around him. The game is fondly remembered by Carlton fans as the stage on which Carlton’s champion defender Stephen Silvagni soared to an impossible height in taking one of the greatest marks of all time - but it also included the awful moments when two Blues; Dennis and Warren McKenzie, had their careers brought to a crash-stop when their knees buckled under them and ended to their seasons. The injury sustained by Dennis was done in his typical fearless approach on the ball where he took a mark running with the flight of the ball. He pirouetted in the air and landed on the soft MCG turf whereupon his body twisted with his momentum but the knee didn't. It was almost a year before Dennis returned to Carlton’s senior team, and although he was selected in the WA state side for the match against Victoria in May, it was plain to see that the edge had been taken off his confidence. His cause wasn’t helped by Carlton’s form slump, either. 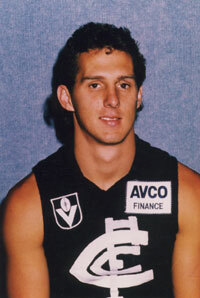 As the Blues slid from third in 1988 to eighth in 1989, Dennis played ten matches. That fell away to six in 1990, and another six in 1991. Never a club to dodge the hard decisions, Carlton told Dennis that he was being put up for trade, and found a suitor at North Melbourne. The ‘Roos sent handy utility Ron De Iulio to Princes Park, and Rocky Dennis crossed to Arden Street in a deal that certainly fell Carlton’s way. De Iulio became a minor cult figure in his 100-plus games in navy blue, while Dennis lasted just one season with the northerners, kicking six goals in 13 matches. Ultimately, the Richard Dennis story is a minor tragedy. But the bottom line is that in one special season, he climbed to the pinnacle as a footballer, playing for his state and winning a Premiership medal. No doubt he yearned to play much longer, but there are many other 100-gamers who would cheerfully swap their careers with his. By 2000, Dennis was back at East Perth, in a mentoring role for the clubs' younger players. Contributors to this page: pblue , Bombasheldon , PatsFitztrick , WillowBlue , molsey , true_blue24 , Jarusa , nikki and admin . Page last modified on Tuesday 21 of August, 2012 22:12:23 AEST by pblue. 1950 B & F Winner: Arthur Hodgson. 2001 - Darren Hulme Interview (28/02/01).